No pipe frames are necessary. Any tent can be quickly and easily set up simply by blowing air into it. 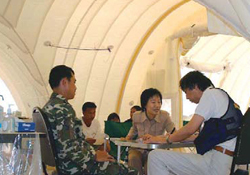 Quick Air Dome Compo is an air tent that makes it possible to promptly provide well-sealed temporary space during a disaster or a infectious disease epidemic. 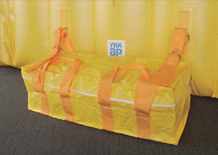 A number of YKK AP tents have already been used in Japan and abroad, and their functions have been highly praised. The tent can be easily erected simply by blowing air into it. It can be quickly and easily set up ; no pipe frames are required. 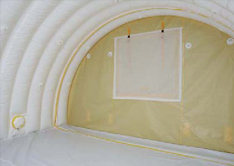 Double-skinned polyurethane sheets have 300 mm dead-air spaces, which make the tent more impervious to outside air and suppresses condensation that may build up inside. Prevents rain, wind, dust, and insects from entering the tent. Sheeting allows sunlight to pass through the tent to keep the interior bright. The awning is a white sheet that allows medical service staff to easily monitor the complexion of patients. Each unit is joined by fasteners. 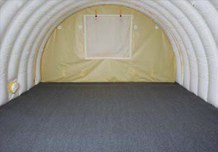 Units can be combined to flexibly expand the tent to meet situational requirements. 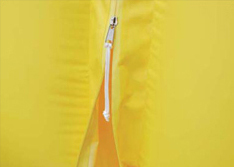 Water repellent fasteners are used in joints to provide a waterproof structure. 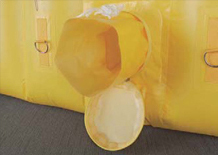 Water repellent fasteners also have a high level of air tightness and are also suitable for controlling negative or positive pressure inside the tent by using a negative or positive pressure generator(optional). 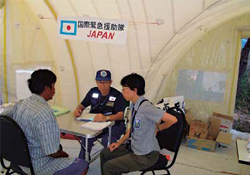 When a disaster such as a large-scale earthquake strike, facilities for relief and restoration activities must be quickly provided. Specific areas for treating the injured, and the headquarters for directing activities as well as spaces for storing supplies are essential. Quick Air Dome Compo quickly makes these spaces available. 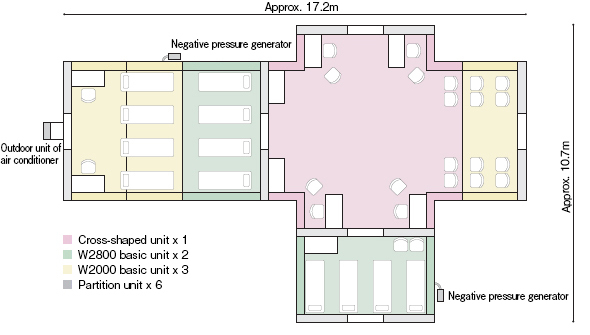 Units can be flexibly combined and interior space can be partitioned as required. 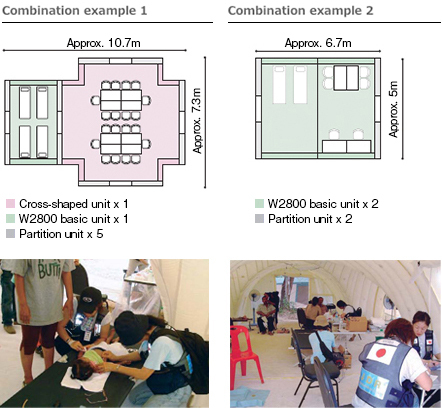 This makes it possible to increase space or functions based on the disaster situation and human resources required. 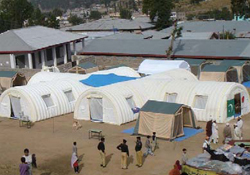 A space for providing first aid and rest to the injured. It can be used as a triage area in which treatment options are to be decided based on patients’ conditions. An area where damage status is assessed and recovery activities are directed. 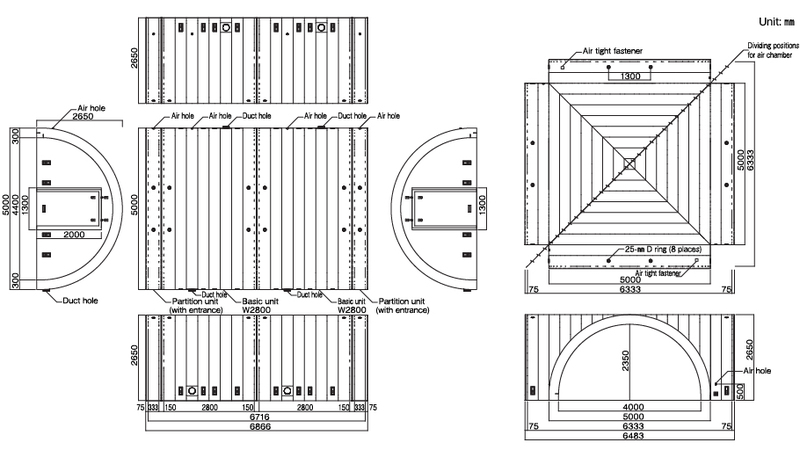 Spaces for setting up tables for telecommunication equipment, PCs and other equipment and for laying out maps are essential. An area for rescue team members or emergency group members to rest. 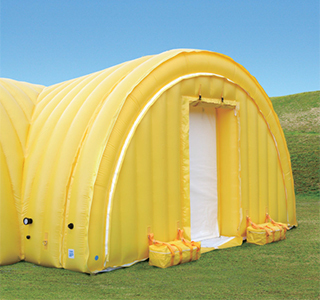 Able to be used as storage space to protect rescue equipment and relief goods from wind and rain. 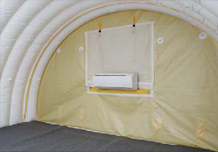 Provides a well-sealed temporary inspection station/clinic. When taking countermeasures against an outbreak of infectious diseases, such as new influenza, it is necessary to identify and promptly handle infected people, and protect uninfected individuals. It is also necessary to pay as much attention as possible to prevent others from becoming infected in the inspection area. 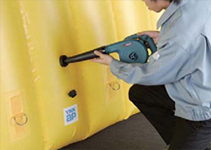 A well-sealed, sophisticated Quick Air Dome Compo can be used as a temporary inspection station/clinic in these circumstances. Using a negative pressure generator makes it possible to use the treatment room as a negative pressure room, creating a safer environment. 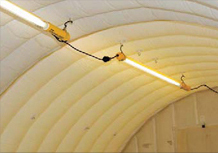 Quick Air Dome Compo makes it possible to provide negative or positive pressure inside the tent with an optional negative or positive pressure generator. 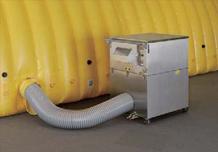 A space in which atmospheric pressure is reduced to prevent bacteria from escaping into the environment is called a "negative pressure room". Negative pressure is created by removing a large amount of contaminated air through a filter (bacteria is caught in the filter). 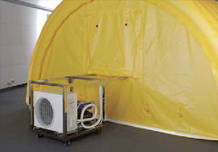 A negative pressure room is used to isolate or treat infected patients. A space in which pressure is applied to the inside of a room to prevent outside air from entering is called a "positive pressure room". 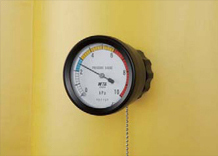 Positive pressure is created by feeding clean filtered air. Available as a makeshift treatment area, or an area to change into or out of protective clothing, and so on. ＊Pricing information is available on request. 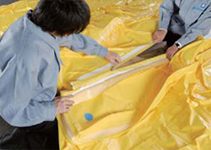 Remove the tent unit from the storage cover. Spread the unit out. Spread the units to be joined in the same way. Do up the fastener to join the units. Joints are identified by blue circles. 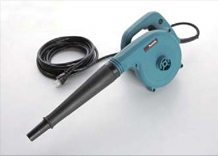 Blow air into the tent using the blower. The tent will inflate and erect itself. Provided on an as-needed basis. Used to blow air into or out of the tent. Water tanks filled with water or sand are used to anchor the tent. 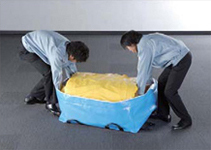 A pack containing three 10-liter water tanks is included. 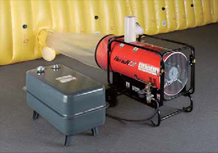 Connect jet heaters, a negative or positive pressure unit. ＊Included in the basic unit as standard. A regulator designed to maintain pressure in the tube constant. ＊Included in all units as standard. Used to measure pressure in the tube. 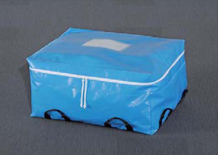 Tent body is placed inside this bag for storage. 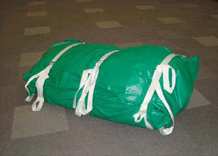 Tent body is covered with sheets and secured with buckles. Connected to a window to adjust room temperature. Connected to a duct hole to blow strong warm wind. 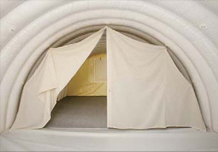 Makes it possible to use the inside of the tent as a negative or positive pressure room. To partition the tent quickly and easily, it is to be hung on hooks inside. 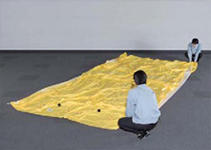 Cushioned mats to be laid out on the tent floor. Displays a logo or signs depending on the intended use. 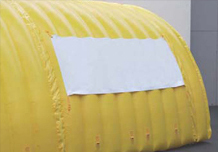 Resists wind speed up to 25 m/sec with water tanks filled with water, sand, etc. 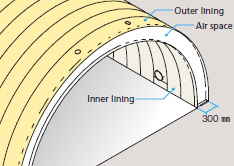 The use of water repellent fasteners ensures sufficient water- and air-tightness. Doors can be opened to allow movement of air and ventilation. 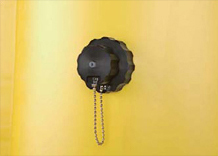 Each unit can be joined with slide fasteners attached to the ends of each unit.